Childhood Depression: where are the words? part two | Your'e It! 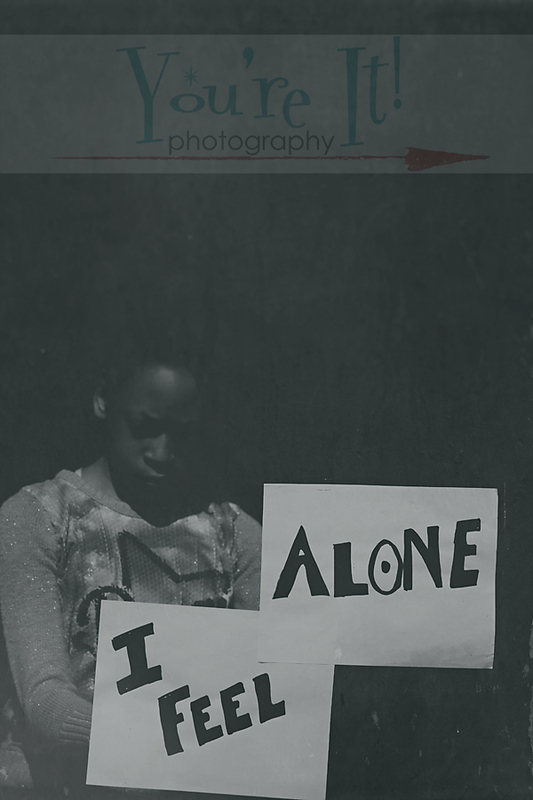 Photgraphy: paying it forward, one click at a time. Sometimes its difficult to find words to describe your feelings. Words don’t come easily when you are dealing with your twin sister being emotional, angry, hospitalized for depression and feeling like she wants to kill herself. Words don’t come easily for most people when dealing with a loved one who is travelling on a downward spiral. I know. I’ve been on both sides of the spiral. Meet “TT”… After talking with “TT” for a few sessions, I can see how scary some words must be for her. “TT” is 12 years old and deals with more than she should have to at this sweet age. She is always polite, soft spoken and she gives me a hug every time I leave their house. But there are days, maybe too many of them, when she has to deal with the anger, emotional unpredictability and the demands of her twin sister “T”, who was featured in Part One of this mental health awareness story. 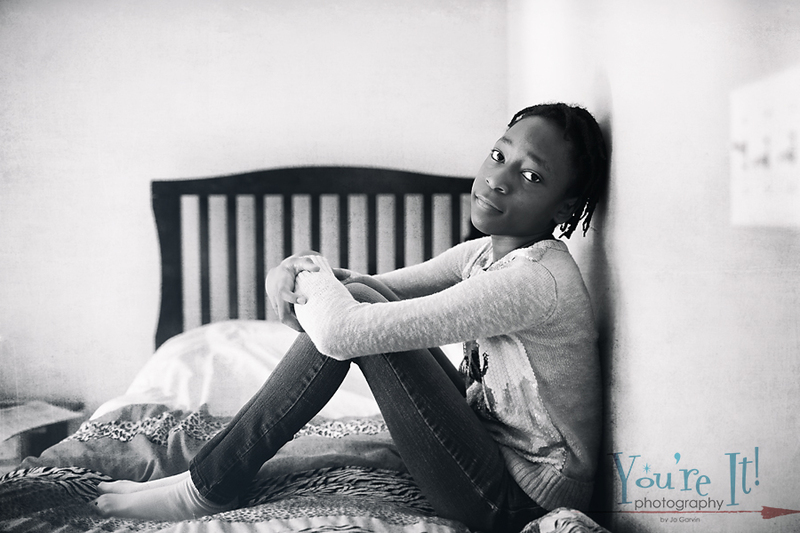 After talking with her and working with her twice now, it is apparent that her bedroom is her oasis for peace in the midst of stormy chaos that she often experiences with her family, typically her twin sister and so that is where we started this portion of the visual story. When you have two or more children, a parent’s time is not always divided equally, no matter how hard we try. Most parents I know with multiple children have one child who demands a little more time, energy, love, you name it. The same goes for this family. As parents, we are equally stressed for the child/ren who are often temporarily neglected when we have to diffuse the behavior of the child expressing more need. It happens in the best of families. We, as parents know this; we hate this. This is life. Life is not always pretty. Life is not always fair. “TT” experiences this more than she should. “TT” finds ways to cope when she is scared and feels alone. She goes to her room to hide away from the chaos. She hides in her bed, under the covers. She covers her ears to not hear the fighting and screaming. I am not sure what the words are that scare her, but I can tell “TT” struggles to express her feelings in words. So right now, hiding is what helps when there isn’t a parent available to hold her. This makes her feel safe. 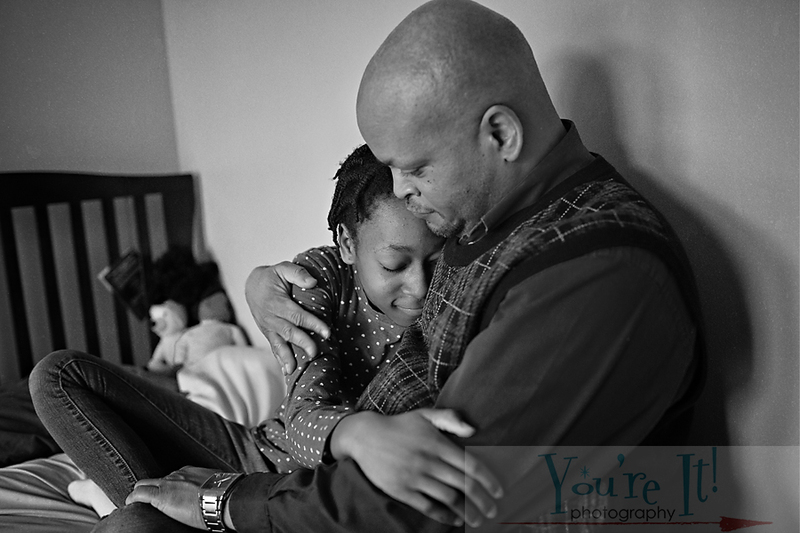 When an extra parent is available to meet the needs of both kids at the same time, “TT” spends time in her room with her Dad holding her while her mom tries to calm her sister. Her Dad is a quiet, gentle soul like his daughter. I can see how they would be a source of comfort for each other. So, what do you say to someone who is struggling? How do you ask for help when you can’t find the words? How can you help when you don’t know where to start? Here is the secret, it’s quite easy. Show up. Be there. Tell them you love them. Tell them they are not alone. It doesn’t matter if you can’t relate. It doesn’t matter if you are scared they will turn you away or that you will say something dumb. Maybe your hurting loved one will complain you don’t understand, say you can’t fix anything, there may be many ways they may push you away. Don’t give up, this is when they need you most. One thing to not do is to tell your loved one they shouldn’t feel a particular way because if they say it, they feel it. What you can do is just listen, you can point out that there are people who can help them feel better. You can call a doctor, counselor or maybe your church has resources to consult. And if ever in doubt, suicide hotlines can support you to find help, even if the loved one isn’t threatening suicide. The national hotline is 1-800-273-8255. Below is a photo “TT” and her Mom. 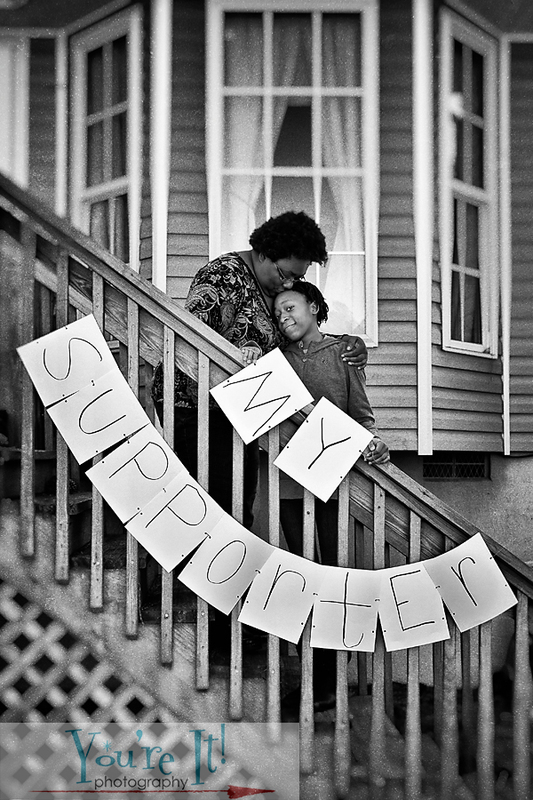 This was an important photo for her to do with a message to communicate: support. 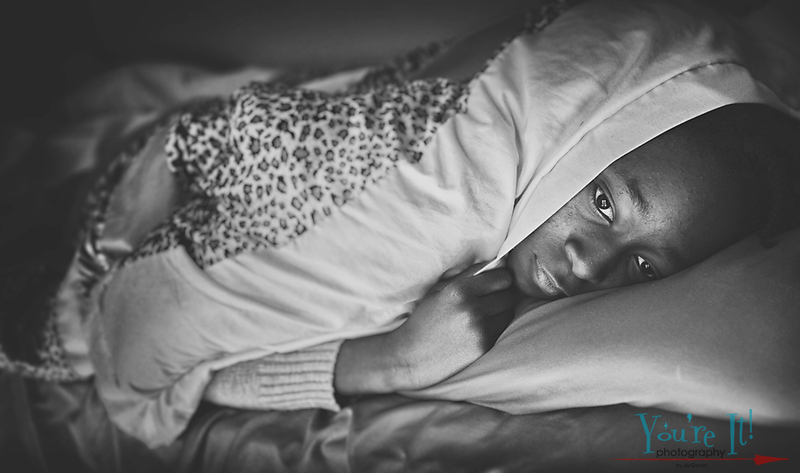 Through all of the trauma she experienced with her sister being depressed, hospitalized and wanting to commit suicide; sharing her parents, feeling afraid, just dealing with being a preteen, she still knows her Mom, (like her Dad) is in her corner, just as much as they are in her sister’s corner. Why? Because they listen, they love, they talk and they show up. When you feel helpless or don’t know what to do just show up, listen, listen some more, remind your friend or family member you love them and if you think they want to hurt themselves, ask and talk about it. Call for help, don’t wait. 1-800-273-8255. We intended for “TT” to write much of her story, like “T” did. At this time it’s just too much for her. She may one day write her own words for these photos, but for now her parents and I are trying to summarize as best we can for her. She is a supportive sister and young lady with a giant heart. I am in awe of her bravery to participate in her family’s story and desire to stop the stigma of mental illness and start talking for mental health awareness. Childhood Depression: Part One can be seen by clicking here. Please share this family’s story.